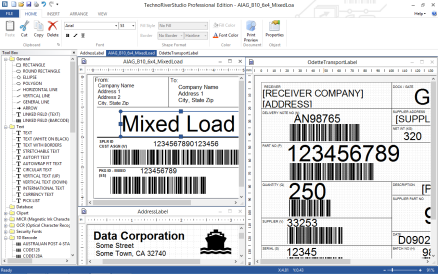 TechnoRiverStudio is an industry-leading label design / barcode software that supports modern barcodes. It includes the GS1-DataBar, expected to be the next major barcode symbology used on many trade items. TechnoRiverStudio is feature rich and yet extremely easy to use. It has comprehensive database support, powerful design capabilities, flexible database integration, extensive barcode support and a highly intuitive user interface. The software also implements multi-language labels, allowing different languages to be entered on the same layout and enables users to design labels targeted for the international market.